I signed up for an archaeology class during my first year in college. It was a disappointment. I thought that we’ll be visiting archaeological sites and dig up some relics. All that I did was read books, attend class, and pass some papers. I didn’t took another Archaeology class again and I thought that seeing an excavation site is not meant for me. I was wrong because 10 years later I accidentally visited an excavation site – not in the Philippines but in Ayutthaya, Thailand. Ruins of the Portuguese Village. The ruins is what remained of the Portuguese Village in Ayutthaya. It was the home of Portuguese traders, soldiers and priests – who settled in the rich Kingdom of Ayutthaya. The map of Ayutthaya Kingdom. The Portuguese Village is located far away from the popular tourist spots of Ayutthaya Historical Park. I believe that very few tourist buses venture here. From St. Joseph Church, I biked to the village for about 20 minutes. The place is empty. I was the only tourist who was in the village at that time and it was a good thing. It meant that I can roam the place without other people photobombing my shots. The Portuguese Village is a testament of the very long relationship between Thailand and Portugal, which started in 1511 when a Portuguese diplomatic mission was sent to the Siamese court. The mission was meant to settle any dispute on Portugal’s invasion of Malacca. The diplomatic mission was a success because the king has no dispute. In fact, the king and the Portuguese immediately created a good relationship after that first diplomatic mission. Five years after the first diplomatic mission, Portugal and Ayutthaya concluded a trade treaty. Portugal will supply firearms and ammunition while Ayutthaya guaranteed the Portuguese a place for their settlement. Around 300 Portuguese, most of them traders and soldiers, settled in Ayutthaya. Almost 200 years later, the population grew to 4,000 people. 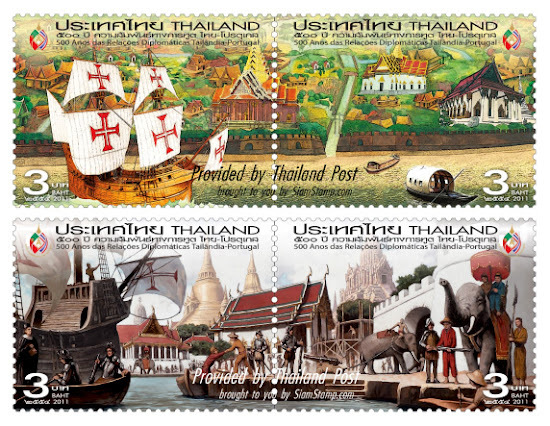 Commemorative stamps celebrating the 500 years of diplomatic relationship between Portugal and Siam. Aside from trading, the Portuguese also served as mercenaries for the Thai king. They fought wars against the Burmese. They also trained Siamese soldiers on the use of firearms. The Portuguese village was not spared when Burmese invaders razed the city of Ayutthaya in 1767. The Portuguese fought bravely but they were short on ammunition and supplies so they had no choice but to surrender. Their latrine is quite big, right? The altar was gone since the Burmese ransacked the holy and precious things in the church. Aside from the Dominicans, the Jesuits and Franciscans were also present in the Portuguese Village. Excavation site of an old Catholic cemetery in Ayutthaya. In the building behind the church ruins is the most exciting part of the excavation site. It is the cemetery where some of the skeletons are displayed to any tourists who cared to visit. People who were buried in the village is composed, not only of the Portuguese, but also of Thai who converted to Christianity. The skeletons were not the only items excavated in the Portuguese Village. There were also crucifixes and other religious items, coins, and Chinese porcelains. Sadly, I didn’t find any of such items lying around. That would’ve been an excellent souvenir for this trip. At the back of the excavation site is an interesting sight. It is a small house built by Thais for the spirits. This “spirit house” is unusual because it housed the statues of Saint Peter and Saint Paul. Incense and flowers are offered to them too just like the revered heroes of Thailand. I am glad that I went beyond the usual during my tour around the old city of Ayutthaya. I was able to visit some unusual spots like the Ayutthaya Church and the ruins of the Portuguese Village. My biking under the sun was not in vain. 1. The Portuguese Village is usually not included in the itinerary of Ayutthaya tours so don’t expect any tour company to take you there. The village can be reached by riding a tuktuk or a taxi. The best way to reach the village by biking. Bikes may be rented from shops in Ayutthaya. 2. There was no entrance fee during my visit to the Portuguese Village. In fact, the people guarding the excavation site didn’t bother me when I took photos and roamed the place. 3. There were no shops in the vicinity of the Portuguese Village so it is advisable that you purchase water and food while in the main city of Ayutthaya. Information regarding the Portuguese Village was obtained from the “History of Ayutthaya”. Image of the stamp obtained from Siam Stamp Catalogue. Interesting place. They burn incense like how the Chinese burn their joss sticks. Yes. It is an interesting mix of Chinese/Buddhist and Christian elements. I also seen this practice in Binondo Chinatown. Filipino-Chinese burn joss sticks in front of a big cross along Ongpin Street. This is an interesting excavation site and how they left the skeletons there for display for tourists viewing. The truth is, I felt bad for the skeletons. They are still dead people and they deserve their rest. Oh, my. What used to be a haunting place is now a tourist spot. History is so rich. Interesting. Correct. There's so many things to discover in our history.